Background: Î²-adrenergic signaling mediates progression and invasion in many cancer subtypes. Î²-blockade is associated with improved outcomes in breast and prostate cancer. The impact of Î²-blockade in pancreatic adenocarcinoma (PDAC) is not established. Methods: Clinical data were abstracted from a prospectively collected database of resected PDAC at a single high-volume institution. Î²-blocker use was noted, and histopathologic and oncologic outcomes data were investigated. A proposed mechanism of tumor biology is explored in a human-derived model of PDAC. Results: Pancreatectomy was performed in 1,933 patients for PDAC. 397 patients were taking Î²1-selective-blockers, and 60 received non-selective Î²-blockers. Non-selective Î²-blockade is associated with decreased perineural invasion compared to Î²1-selective or no Î²-blockade (NoÎ²) (non-selective=68.3%, Î²1-selective=84.9%, NoÎ²=85.9%, p<0.001). 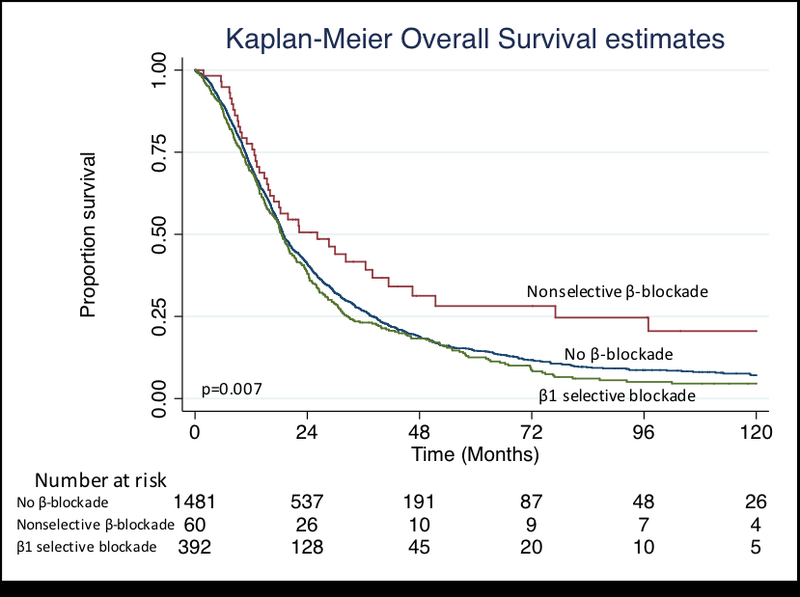 Non-selective Î²-blockade is associated with longer overall survival (median: non-selective=26.1 months, Î²1=18.5m, NoÎ²=18.8m, p<0.01). With these data associating Î²-blockade and perineural invasion, a paracrine mechanism involving noradrenergic hormones was hypothesized. Recapitulating this in-vitro using a human PDAC cell line, norepinephrine administration demonstrated increased cell growth and migration. Co-administration of propranolol successfully abrogated norepinephrine-induced growth and migration. Conclusions: Non-selective Î²-blockade is independently associated with decreased perineural invasion and improved overall survival in resected PDAC. In-vitro, norepinephrine stimulates cell growth and migration. While propranolol does not impact cell growth in isolation, co-administration with norepinephrine abrogates the increased growth and migration seen with norepinephrine administration alone. This work highlights the impact of commonly used antihypertensive medications on tumor biology and may elucidate a rationale for the use of common antihypertensive medications as therapeutic adjuncts in PDAC. Figure 1. Overall survival comparison of resected PDAC patients taking non-selective Î²-blockers, Î²1-selective blockers, or no Î²-blockade.